Red, White and, um, Sangria? It’s summer. We’re lazy. As my late best friend Ian Hartman once wrote, “I feel the urge to sleep even as I write this.” And as Alice Cooper said, “We can’t even think of a word that rhymes,” as you saw from the headline. This is a lazy column too, a couple hundred words compared to the usual [long] length. Hey, I want to go home, too. So it makes sense that in summer, the fancy craft cocktails we carefully concoct with skill and measuring equipment and fancy ingredients give way to something…easier. And the easiest way to avoid repeat trips to the bar is to a) give your guests “a choice of one” and b) batch up some stuff. Bloodies. Sun tea. 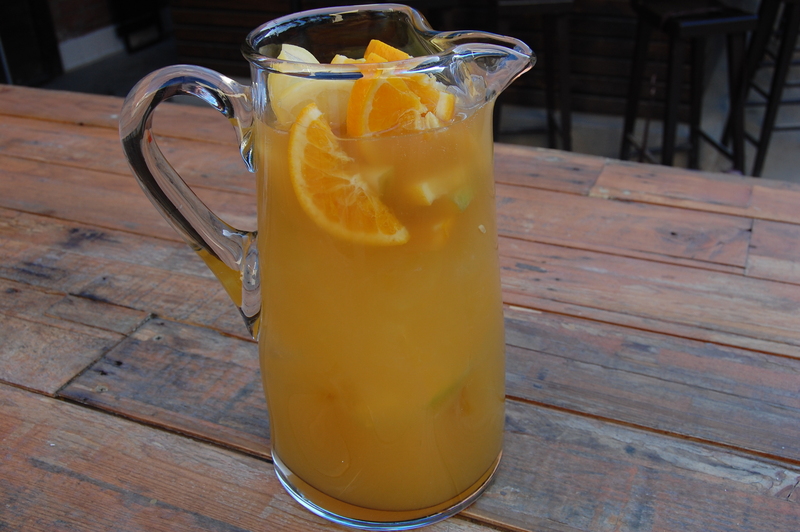 Or, a pitcher of sangria. Our friends over and Bow and Truss in North Hollywood are totally on board the craft cocktail train and at one time had a host of cocktails made with Spanish sherry, many of them served in cute little Marie Antoinette glasses: coupes modeled, legend has it, on the shape of the queen’s breasts—possibly giving rise to the adage, “anything more than a cupful or a handful is wasted.” We lament the loss of the Spanish-themed drinks menu but they still move a lot of this stuff out on their raked sand patio in the long afternoons of air light they’re enjoying now. If circumstances prevent an in-person visit, Bow and Truss’ sangria is a cinch to make at home. Mix all ingredients. While the sliced fruits look best freshly sliced, they TASTE best after they’d infused the mixture for a while. Mix all ingredients and add fruits and let stand for an hour. Fruits change with seasons but this batch was made with lemons, apples and oranges; throw in a few strawberries for color contrast! Each makes one big pitcher. Serves from 2 to 6 people. Have at it! Summer Friday! PS and if you can, and happen to have a lot of money, check out our friend Ian Blackburn’s Laftite Wine Dinner at Josie Santa Monica in July 17. We can’t make it because a) we can’t afford it and b) we will be downtown watching Chop and Quench at Grand Performances…it’s FREE. This post is sort of a cheat. 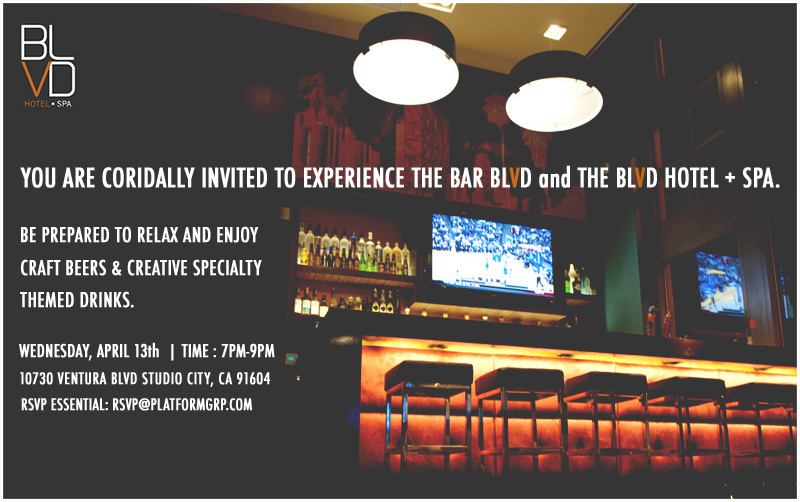 The drinks come from somebody else; it’s filled with shoutouts to clients past and present; and they were created for a bar we represent. But what’s cool about them is a) Jesse’s Damron’s a bar genius whose talents deserve to be shared with the world—he’s kind of the king of the layered cocktail and he gave me some drinks for this series that were almost too complicated to make in any quantity b) some of this stuff is REALLY good, and we wouldn’t have taken them on if we hadn’t thought so, and c) if you’re in LA April 13 I invite you to try them with me at the opening of Bar BLVD. So in those respects, I guess it’s exactly what Killer Hooch is supposed to be about and…you can try this at home! Sophisticated and savvy, this cocktail combines Bacardi Razz, Koloa Hawaiian rum and coconut rum, sweet lime juice muddled with raspberries, strawberries, simple syrup and mint leaves, topped with club soda and garnished with a lime. Shake above ingredients and pour into a highball glass. top with ice and club soda. Garnish with a Lime. Edgy and unpredictable, the Sunset Blvd pays homage to the road of rock & roll. Blends Bombay Sapphire Gin, Zen Green Tea liqueur, Triple Sec with min, simple syrup and a dash of…water. Garnished with mint sprig. In shaker with no ice muddle 8-10 mint leaves and 1/2 oz. of simple syrup. Soaring and airy, uncomplicated and refined like the soaring towers of the Wilshire corridor, Wilshire BLVD is Haamonii low-calorie shochu, Elixir G and whit cranberry juice. Garnished with lemon slices. History meets contemporary in this dusky, exotic cocktail. Root liqueur, Langer’s Mongo Mango, Elixir G and Gosling’s Black Seal Rum mixed with Rose’s Cherry Grenadine and a sprig of rosemary. Very potent; keep your hands and feet inside the ride at all times. Beware the snake: BLVD’s fresh organic margarita, the La Cienega BLVD features Tequila Tierras–the first TTB and USDA ORGANIC Tequila in the US—agave nectar and fresh lime juice. Like the famed shopping district, the Robertson BLVD is a playful, inviting confection featuring Blue Angel Vodka, Martini Gold Pomegranate mixer and martini Gold Chocolate mixer garnished with fresh crushed cherries. Want to try them with us? Mention Killer Hooch in your RSVP and come see us next week to try these cocktails for yourself!